Born in 1977, the Columbian conductor Andrés Orozco-Estrada has quickly established a reputation as one of the leading musicians of his generation. Recordings he has released so far, including Stravinsky’s Rite of Spring and Firebird and Berlioz’s Symphonie Fantastique, as well as some of his more distinctive concert programming – Gershwin, Ives, Kodaly, and Strauss’ Also Sprach Zarathustra – have shown an emboldened conductor unafraid to dazzle orchestras with his individualistic, yet disciplined, ear for sonority and colour. It’s a confident young conductor indeed who would take on Strauss’ complex and virtuosic Ein Heldenleben but the results are little short of astonishing. One of the remarkable things about Orozco-Estrada’s Ein Heldenleben is that it rarely seems to struggle under the weight of there being “too many” notes, though a lot of this has to do with the superb definition Pentatone have given the orchestra. If any work requires state of the art sound it is this piece, and the engineers have largely allowed the Frankfurt players and Orozco-Estrada to untangle some of the densest writing with enormous clarity. That huge E flat opening has uncommon breadth as well as huge dynamic range, and Orozco-Estrada isn’t remotely afraid to be visceral here; the impact is brutal. One of the absolute glories of this performance is the rich bass line, something other conductors, or engineers, seem to ignore in this work of high contrast; Strauss was meticulous in his notation for the strings, though in so many performances you’d struggle to guess this. Just listen to the Frankfurt double basses at Reh.9 until 6m. to Reh.12 (2’43” on the track). At the Langsam marking just before Reh.102 Orozco-Estrada observes each crescendo, f and ff for the double basses as Strauss marks them (38’25”), something which I can barely recall in any other performance of this work. It’s a pity he doesn’t observe the ff for the double basses at four bars after Reh.92, however, something which only Tatsuyo Shimono and the Czech Philharmonic Orchestra (Avex AVCL 84032) do in an even more glorious recording of this work (my reference recording of this Tone Poem). The two closing sections of the work are both implacably turbulent and tormented in their intensity in Orozco-Estrada’s hands, moving between moments of utter humanity (such as in the timpani that pulses like a human heartbeat) and the soaring, meltingly tender restatement of the Love Music. The English Horn solo, in the chord of C major, between Reh.99-101 is stunning. When we come to the coda of the work, Orozco-Estrada is able to combine ardour with impetuousness, as the last voices, and they truly are voices, a horn and a violin, one falling as the other ascends, as if on a rollercoaster from the heavenly to the earthly, reach their respective E flat. Despite the one issue I have with the trumpets before the Battle, Pentatone’s sound is absolutely in the demonstration class. I love the rich string sound the Frankfurt orchestra have been given, the beautifully evocative solos and even when the orchestra is at full throttle some of Strauss’s most complex writing and harmonies can be fully heard. Everything about this performance breathes with both passion and darkness, climaxes are prepared with considerable care and as in the very best Heldenleben’s it is never a case of pushing for maximum volume. The lack of tracking for the work some might find a problem, though one should remember Strauss did remove the titles of the separate movements from his score, and apart from one extended luft pause the work should be played continuously. 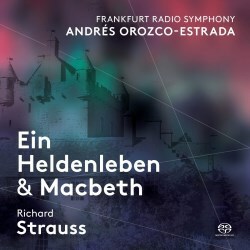 Orozco-Estrada’s Ein Heldenleben is a major Strauss recording in my view. It is almost as fine as Shimono’s Czech Philharmonic performance: both are magnificently recorded and played. Both these conductors show exceptional gifts when it comes to getting to the emotional core of this music, connecting the works autobiographical tangents where other seem to hang themselves, and both solve a lot of the textural issues in the scoring that simply elude other conductors. I wouldn’t want to be without live recordings by Asahina in Osaka, or Svetlanov with the Swedish Radio Symphony, in a powerful, sweeping and epic performance that suffers from rather monochrome sound, either. Nor would I want to be without Sinopoli and the Dresden Staatskapelle in a sensational live recording on Profil. A stunning Ein Heldenleben, and a no less brilliant Macbeth, all in state-of-the-art sound, make this one of the best Strauss discs I have heard in years.